yesterday its really chilly. in the night i busy with posting a blog entry for my newly claimed sites for my home town, zhudajiu, a mountain village in Central China. this morning after getting up my first thought is if it snown last night. on the way to office i saw the snow was heavy. i don't feel too glad to see the white, for it hinders me to carry my new camera with me as i intended. i remember in the urgent moments when i in need of snow to clean the dirty around from staining me, and my inherit love for snow white. this morning again a busy morning. i didn't left my chair except for lavatory. i pushed the last post to my google apps sites, and new logo to all my publish channels. 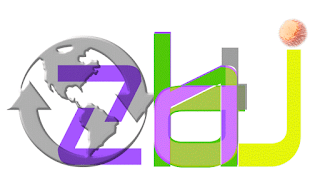 i by the way claimed a new youtube group, dajiuzh at http://www.youtube.com/group/dajiuzh, beside the previous channel of zhdajiu at http://www.youtube.com/group/zhdajiu, and decorated them with their new logo. i ate fast food in office, for the snow covered road really can be dangerous. ok, its a nice morning, in the atmosphere of coming holiday of lunar new year. i also look forward it, for leisure and gathering. ema asked several times why i longing for the holiday, now that my purse was empty and my social circle was meanly and countable. she don't know i always live with hope, and hope with my due glory and pride. 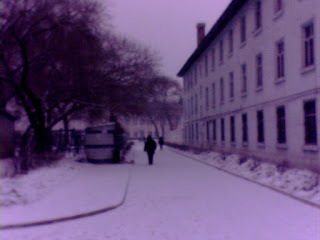 for i didn't carry my powerful new camera, i had to shot this snow scene with my poor cellphone camera. last night baby asked to play games all time. the tv weather forecasted a snow night. this morning i got up early to let pc download, then i found the snow even the moment stopped. all road covered with white, even its a common scene in the north. last snow was heavy and cost quite some time before the road workers clean it from road. 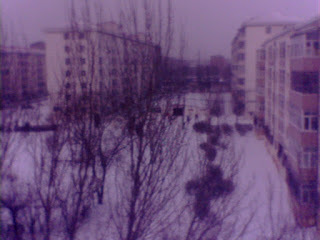 i then picked my new cameraand shot some photos from our windows. i remembered earlier years when baby still just can walk, every snow day i wouldcarried him outside to shot photos, but now baby and me neither have the mood to hang outside. today again most of time accompany baby playing pc games. i m a avid new games chaser while baby just want to make fun. i restlessly monitor the new games' release via p2p networks. its really handy to follow the byte flow of shared stuff, not only u got a birdview of the development of games or warez or music, all kind of resources, their industries, but u also can make a close contacts with the stuff, like a great free grocery shop. these days pragmatic thoughts frequent me, let divine deeply beneth routine life of my being contented with what i had now, esp. the view of my elder time in solitude alone in dusty corner. i put my faith in God, but these days i was stuffed with worry of world leaving me away and helix up. i see the danger of being buried, and the bet to mute me in leasing, i was but left to God, my God. that's my fate. its a not bad day today, esp. now after showered in public bathroom, even a bit with fatigues, the snow continued again when i way home. i long for my home town, in this lunar year end, and holiday celebrating accumulating. i miss those folks, esp. the young generation there. i miss the bright sunshine and the leasure of life. i stayed here for being forgot, for being ignored. i always look forward the new horizon. that's my new year's wish, in ur view, God. attachment is baby son, warren zhu, with his ball candy on Jan 17, 2009, a day before the 7th snow in Qiqihar, China. these days mostly i searched for resource for download, mainly games for baby, warren zhu, or posting photos shot with my favorite first camera. feeds in my google reader awaiting to mark out accelerated some. this morning i received a message from a Chinese portal, Hexun.com, to inform me a pal there followed me. the avatar of the user is a bright beautiful girl, so i was attracted and immediately re-polish my profile there, even i had received several message from the site to urge me to resume my update on the portal some time ago. the task cost me a full morning, for speed connecting the portal very lagging, likely under China surveillance. i managed to be patient, and finished now building 2 public web albums on it, and embody my profile/avatar. now i need a blog to open my home, http://hexun.com/riveryog , there. these days i really enjoy my first camera, after reading carefully its manual, i now can feel confident that i m able to make full usage of its all features. i really glad to see its powerful. i hope sooner the icy road turns to less slippery, then i will brought it with me all time to shot what i like. these night we all slept lately, for baby attracted a lot by games i got from web. with my new and first notebook i also fond to linger on it later, which brought baby's mother, ema's lots of complains. i surely live with joys and day by day see the light at the end of the tunnel of obscure. its a bright sunny day outside of the window. i always felt the joyful atmosphere of lunar new year. ema asked why i need the holiday, now that i m old enough and earn so poor. she don't know i own. i own the land and kingdom from my ancestor, i own the earth. ok, that's my first blog here on hexun.com, second site beside qq.com i likely will keep building with. i don't need it be perfect, but i can be known the level Chinese portal can achieve. attached a photo of my first camera&notebook. they need me to remember them. full moon and bird in the morning sky. full moon over the city tower, outside of window. baby gaming on pc with his mom. baby's mother, ema, more or less unbalanced upon my purchase of a camera and a notebook, so she ask for treat and i permitted. we dined out nearby. i of cause bring my camera and here is the scene of our gathering. others are our family life at home. baby also tried the camera to shot me. its all too beautiful with the so nice camera. the weekends i mainly preparing a working environment on my notebook, for backup. baby likes the new camera and the new notebook. he now asked to own the old pc solely. all after all, its just too perfect of my life. i hope my shooting skill improved sooner. today the first day of separation after last night blizzard where i scorned baby and warned him the evil&danger of his mother's family, including his mother herself. i busy with my routine work all day. baby's mother absent at noon when i returned for lunch. baby also absent, while in the morning they lingered at home as ema told me previously she in break, and i ate remnant of porridge she cooked yesterday. i hated baby under expectation, but i more hated his mother and her family. evil never left the house of ema. i trust God let my baby turning to normal way, to be a honest and respectable man. God sees. he is in fact the God of mine, and i just do what i had to do to manifest to all around the house, those spies, and his mother's family, including herself. i need time to fine tune my baby for what i observed and learned of God's way. his mother and other evils just fear and attempted to block my due task to father my baby son, warren zhu, hope of China and the God of the universe. i do, i did, and i done well, i oath. its a sunny day today, which pacified me so much. i dozed all the morning in office, and dreamed losing of my baby, and contacting the woman (ema?) who gave birth of my baby and now lost her right eyes, trying to reborn my second baby son, to satisfy my deep sorrow and untouchable pains for my losing baby son. the woman likely not gifted and in miserable situation and under her new man's control, but she tried to satisfy me. i don't believe in the dream, i just felt the pains of losing my baby. but, after all, i think my burst last night is a rebirth both for my baby son and myself. in the past days we covered by too much dirty evils. and i believe in the sunshine and the sun right always on me and the Royal of mine. that's my review today. i look forward to live and forever live with my baby son, warren, for the oath i prayed to God when i in turbulence before last time fell into asylum to cure my hopelessness upon evils on my baby son in infancy, i will forever attending him, just like attending my passed grand Father. i look through all clouds for the day i see the right layout of my kingdom of China from my ancestor of glory centuries ago. dad, God, u see. today is the first day of 2009, and a big brightly sunny day, adjoined with last bright sunny day of Dec 31,2008. last night baby played game 'strike ball 3' i just got from p2p networks all night and lots of funs, and today they gathered in his mother's relative's home to lunch. all things went bright, except this morning i again felt the pain of lacking a camera of my own. that's a long time wish list of mine, i like shotting and blogging, but i don't equipped with a considerable satisfying camera for my work. i also want a smartphone, with which i can browse websites for mobiles, and check my email and adding new apps from download. but that seemingly too early for people within China like me, where iphone and G1 with google's mobile os likely both under negotiation with China telecoms to settle deal, to comply with China surveillance as well as the telecom's monopoly. but this day. or this beginning of the year, i especially felt sad, for years i can't afford to buy anything to celebrating the holiday. i still live in the standard just fitting for food, i can't afford to travel, to electric gadgets, to house, to budget a plan to improve my skill. i live and only living for hope, in the wanting. i was constrained for years here this pitfall, and likely had to wait to see my best beloved to gather around me to make fun, to make love, to make living and lives. God let me endure so long, i hope i can also entertain myself with gadgets, like camera, pmp, or game socks, or larger lcds, or even a notebook or netbook. oh, yes, i still in seat and belt. i live for reclaiming my kingdom of my ancestor in glory, and i see closer and closer the horizon. i do need ur highlight attention, God. 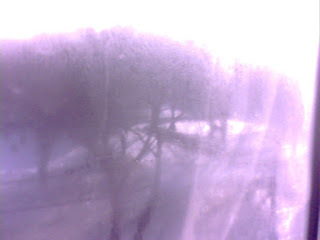 ps: attached is photo shot yesterday with my poor cellphone camera, and today's sunny scene outside of ema's house with her also outdated camera.